Filled with over 100 helpful lists, naming tips, and a collection of boy-centric names to browse, this book makes it easy to find the ideal fit for your family. Gone are the days where you need a massive compendium of baby names to sift through (half of which don't even apply to your little one!). Now, whether you want to go classic with Christopher, literary with Holden, or trendy with Wilder or Bryce, THE BEST BABY NAMES FOR BOYS is there to help you discover your son's perfect name! 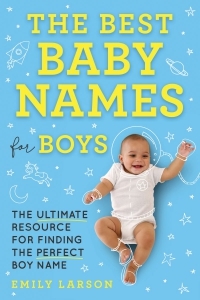 Perfect for baby showers, gender reveals, and parents with a little boy on the way, THE BEST BABY NAMES FOR BOYS is the only naming book created with baby in mind.